Case Keenum and Kellen Moore are two of the most productive quarterbacks in NCAA history, but all their big numbers couldn't overcome some smaller numbers – the height of each guy. Moore, from Boise State, is the winningest starting quarterback in NCAA history, having guided the Broncos to a 50-3 mark. 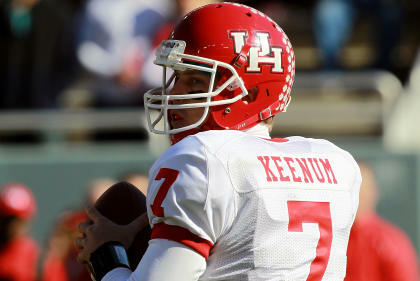 Keenum, from Houston, is the most prolific passing quarterback in NCAA history, having graduated with records for most passing yards (19,217), most passing TDs (155), most completions (1,546) and most total offense (20,144 yards). Both completed better than 69 percent of their passes, too: Moore at 69.8 percent and Keenum at 69.4 percent. But neither was selected in the 253-pick NFL draft. The biggest knock on both is their size. Keenum was measured at 6-0½ at Houston's pro day, while Moore measured in at a shade over 5-11½ at Boise's pro day. Those aren't the only negatives. Moore, especially, was dinged by pro scouts for lacking arm strength. Keenum also faced that knock, as well as the fact that he always took snaps in the shotgun and never under center. Keenum also missed most of the 2010 season with a severe knee injury. Still, looking at those numbers, you wonder why a late-round pick wasn't used. Not to pick on Brock Osweiler, the Arizona State product who was the fifth quarterback selected (a second-round pick who went 57th overall), but he finished his career with 5,082 yards and 33 TDs. Keenum had two seasons in which he threw for more than 5,082 yards, and Moore threw 10 more TD passes last season than Osweiler tossed in his career. Osweiler, though, has a cannon for an arm and measured in at 6-6¾ at the NFL combine. Both spurned quarterbacks will get a chance: Keenum has signed a free-agent deal with the Houston Texans, while Moore signed with the Detroit Lions. Those two could share quarterback duties on a team of undrafted former college stars. Indeed, had our Yahoo! Sports All-Undrafted Team taken the field as a college squad last season, it would've been tough to beat. Important to note is that this is not necessarily a list of players who were expected to be drafted but were not; instead, it's a list of guys who performed at a high (or extremely high) level in college but weren't deemed draft-worthy. Buzz: He finished with 4,542 career rushing yards, along with 35 touchdowns, numbers that become even more impressive when you consider that Western's passing attack was horrible. As for his competition level, he rushed for 116.3 yards per game and scored five TDs in six contests the past two seasons against Big Six opponents, including three games against SEC foes. He lacks size (5 feet 7) and isn't a blazer, and he can't be an every-down back. Buzz: Stewart was a four-year starter for the Buffs and finished with 3,988 yards and 25 TDs in his career. He also caught 93 passes for 969 yards for Colorado. He's a small guy (5-6/175) who has battled injuries through much of his career. He hasn't really been asked to block, but he could make it in the NFL as a third-down back because of his receiving ability. Buzz: Edwards had a sterling career for the Cougars, finishing with 291 receptions for 4,507 yards and 43 touchdowns. He also was a good punt returner after battling back from a gruesome broken leg (he ran into a parked golf cart parked behind an end zone) when he was a freshman. He is a small guy (5-9/172) but isn't a blazer. He's also strictly a slot receiver who can be sloppy on his routes. Buzz: Jones was a five-star recruit in the 2007 class, and for various reasons, his career took a while to get going. But he finished his career with 152 catches for 2,163 yards and 16 TDs. He had 85 receptions for 1,196 yards and 12 scores last season. Jones had a relatively mediocre Senior Bowl and lacks top-end speed. Scouts also noted that for a guy who is 6-3 and almost 230 pounds, he can be bothered by press coverage. Buzz: He left school after his junior season and surprisingly wasn't selected. Had he remained in school, he was a lock to become the NCAA's career leading receiver. He left Toledo with 306 catches for 3,446 yards and 25 TDs; Ryan Broyles holds the NCAA career record with 349 receptions. Page also had five return TDs in his career. Page doesn't have elite speed, and given that he is just 5-9, that likely scared numerous teams. Buzz: He transferred to Oklahoma State after two seasons in junior college and was a two-time All-Big 12 performer for one of the most prolific offenses in the nation. He has had issues with his knee, remains a bit raw at tackle and lacks elite athleticism. Buzz: Reynolds was a four-year starter and a three-time All-Mountain West performer for BYU. He is not the ideal size for an NFL tackle (6-5/302) and he had some trouble with speed rushers. While he was a left tackle at BYU, he would be best-served to play a right tackle or even guard in the NFL. Buzz: Blackwell was an All-America and All-SEC pick last season after battling back from a broken ankle that ruined his 2010 season. His lack of athleticism is his biggest criticism. Buzz: Foreman was a four-year starter for the Spartans, earning freshman All-America honors in 2008 and some All-America mention last season. He lacks athleticism, and while he is a solid run blocker, there were concerns about his pass protection. Buzz: Brewster was a four-year starter for the Buckeyes, earning freshman All-America honors in 2008 and some All-America mention last season. He was a two-time finalist for the Rimington Award, which goes to the nation's top college center, and earned All-Big Ten notice in 2010 and '11. He lacks the quickness of elite centers but was considered both a solid run-blocker and pass-protector. Buzz: Law was a three-year starter for an aggressive Southern Miss defense. He had 28 career sacks, the most of any active player in college football last season. He also had 14 forced fumbles and six pass breakups. He is a bit less than 6-2 and weighs 254 pounds, and thus is sort of a tweener; he could fit as a 3-4 linebacker but never has played that position. Buzz: He earned some All-Big 12 notice last season after missing half the 2010 season with a broken ankle. He had 56 tackles and three sacks last season for the Tigers. He would've been a three-year starter except for the 2010 ankle injury. Some teams downgraded him because he's not that mobile and doesn't move all that well laterally. Buzz: He started for two seasons for the Tar Heels after being a valuable backup for two years. He had 45 tackles as a senior and had 47 as a junior. Some scouts were worried about his consistency, as he struggled at times as a senior and sometimes loses his technique. Buzz: Shelby was a four-year starter for the Utes and started at all three line positions (end, tackle, nose tackle) during his career. He was a first-team All-Pac-12 selection last season, when he had 55 tackles, five sacks and seven pass breakups. He is considered somewhat of a tweener (he's 6-3 and 266 pounds) and never has played linebacker; he also isn't that fast (4.96 in the 40 at the NFL combine). 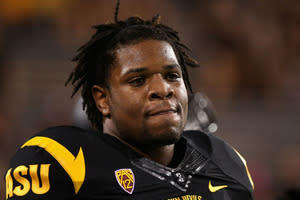 Buzz: The hard-hitting Burfict left school after his junior season and started in each of his three seasons in Tempe. But as instinctual as he is – USC defensive coordinator Monte Kiffin, one of the best DCs in NFL history, called Burfict an "unbelievable" talent last September – he has numerous character issues and did not play consistently last season. He also struggled at the NFL combine and at Arizona State's pro day. Buzz: He was a four-year starter for the Hogs and finished his career with 376 tackles, 10 sacks, 11 quarterback hurries, five picks, four fumble recoveries and two forced fumbles. He also scored four times – twice on interception returns and twice on fumble returns. While productive in the best league in college football, scouts decried his lack of athleticism and mobility. Buzz: He started for three seasons at Cincinnati and made 325 career tackles for the Bearcats. He also had eight sacks, seven interceptions, 14 pass breakups and five forced fumbles. He is coming off a hamstring injury and was clocked in a slow 4.77 seconds in the 40-yard dash at Cincinnati's pro day. Buzz: He was a two-year starter for the Eagles after serving as a key reserve in his first two seasons. Fletcher had 11 picks, 11 breakups and 178 tackles in his career. He is coming off a back injury but still had a 4.51 clocking in the 40 at BC's pro day. He played in the senior Bowl but was not invited to the NFL combine. Buzz: He was a two-time All-ACC first-team selection and finished his career with 13 picks, 18 pass breakups and 151 tackles. At one time considered a potential first-round pick, Minnifield had knee surgery in January. Some reports had it as microfracture surgery, which caused teams to shy away. Buzz: He began his career at Wisconsin at cornerback and earned some freshman All-America notice in 2007. He moved to free safety before his junior season and was a two-time All-Big Ten selection there. At Wisconsin's pro day, he recorded a 39.5-inch vertical leap and ran a 4.53 40-yard dash. Buzz: Baker was a productive four-year starter for the Cardinals, finishing with 18 interceptions and 338 tackles. The picks total was the highest career number for any player in college ball last season, while the tackles total was 12th-highest. 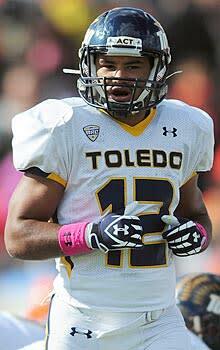 He was a two-time All-MAC pick and earned some freshman All-America acclaim in 2008. He had a shoulder injury in 2011 and isn't all that fast (4.65 time in the 40). Buzz: He finished his career with 74 field goals and converted almost 77 percent of his 97 career attempts. He was 4-of-4 from beyond 50 yards last season and kicked six 50-plus-yarders in his career. Buzz: He led the nation in punting last season at 47.04 yards per boot and had a 44.2-yard career average.